This is the section where you can read about the races I’ve been to and see the photos I’ve taken.As a kid I used to go to Amager and watch stockcar racing, because my neighbour used to drive one of these cars. Sadly I have no pictures from that but in the early 70’s I saw a movie called Le mans with Steve McQueen and I was fascinated by the cars and the speed. Formula One with Jackie Stewart came into my world through TV. It should take me nearly 30 years before I went to race - but then I choused the biggest of them all - Le Mans! 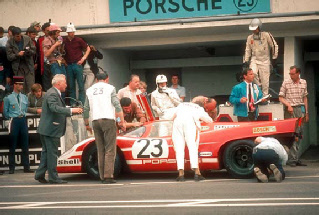 One of the famous races in the Le Mans history most be Le Mans 1970. Some say it’s only famous because of Steve McQueen’s movie, but I also think this particular race is famous, because of the first overall win to Porsche! Click on the picture to read about the movie.